Scheduling your listing for optimal exposure is important to being a successful seller on eBay. 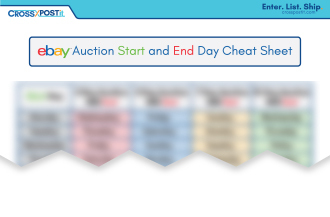 If you start your auction on Monday, do you know when it will end? Using this cheat sheet will help you to know how long you should run your auction based on your start date and desired end date. Print it out – it’ll make your life easier!